When I reflect upon maintaining an active lifestyle during the winter season, I think of Marianne Nelson, mother of Ulla and Dr. Anders Nelson, who passed away last year at the age of 81. Mrs. Nelson grew up in Sweden, came to the United States in 1967 and moved to Pennsylvania in 1975 with her husband and children. Growing up in Sweden deeply influenced her attitude about outdoor activity in all weather conditions. In all kinds of weather, she walked briskly by my home in Dalton, donning a backpack, her dog keeping pace. She walked 5-7 miles at least 5 days a week, sometimes twice a day. Outdoor activity was in her blood: who she was and what she did. At 79 years of age she cross-country skied, and at 81 she hiked the Grand Tetons with her family. Well into their seventies, her relatives in Sweden continue to engage in outdoor activities all year long. They feel that the weather should never limit activity—it just requires some preparation. Warm clothes and studded snow tires, for example, allow “Auntie” to continue road biking throughout the winter in Sweden. Thankfully, a love of outdoor activity isn’t a foreign quality, and many people living in Northeastern Pennsylvania attempt to exercise outdoors year round. The psychological benefits are many: each season brings its own unique beauty, and winter is no different. Most will not have to abandon outdoor activities, but some adjustments in equipment, clothing, and food are necessary for each season and the temperature changes that it brings. Additionally, walking or trekking poles will improve balance and safety when briskly walking in winter conditions. I am a strong proponent of using these tools. They are lightweight, adjustable, and collapsible. Some examples are: Black DiamondR Trail Back – $56.95 and MountainsmithR Rhyolite – $35.09. Alternatively, an old pair of ski poles will work just fine. Snow shoeing and cross-country skiing should also be consider as a viable option for the winter walker and runner. These are great cross-training alternatives with tremendous aerobic benefits. Snowshoes work by distributing your weight over a larger surface area so your foot does not sink completely into the snow. Commonly used by fur traders, trappers and forest rangers, snow shoeing has become very popular among many outdoor exercise enthusiasts. It is relatively safe and inexpensive. Some snowshoes include the Tubbs Flex Alp – $197 and Redfeather Hike – $95.00. Boots and poles are also required, but ski or trekking poles along with hiking boots or winter running shoes can be used. Cross country skiing has also gained tremendous popularity among winter outdoor exercise enthusiasts. It is a cross between running and skiing in which the participant propels through a snow-covered trail by pushing and gliding with a running or fast-walking motion. Some examples of equipment packages that include boots, pole, bindings and skis are Alpina Sports Tour – no wax for $249.00 and Rossignol X 5 from LL Bean at $289.00. Many of the area’s state parks, such as Lackawanna and Promised Land, offer wonderful trails for winter walking, hiking, running, snow shoeing, and cross-country skiing. For the more casual walker in need of protection from the snow and ice, it may be treacherous just to walk the dog or go to the bank, post-office or grocery store. Consider traction devices that easily slip on and off your shoes or boots such as StabilicersR (cleats-type device) or YaktraxR (chain-type device). 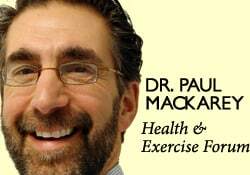 NEXT MONDAY – Read Dr. Paul J. Mackarey “Health & Exercise Forum!” Next Week: Tips For Winter Exercise – Part II of II.